Scooper - Technology News: Can ASEAN compete with the world’s economic superpowers? With the official establishment of the ASEAN Economic Community (AEC) at the end of 2015, there is a growing expectation that the 10-strong trading bloc of South-East Asian nations will soon start to show its mettle as an economic force in the world. 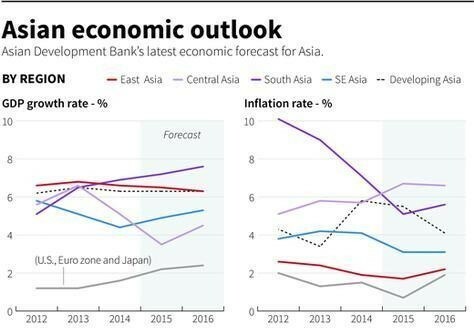 Given the change of pace in China’s economy and India’s headline-grabbing growth story, many political and economic commentators will have their eyes on the development of ASEAN as the world continues to pivot towards Asia. For those of us doing business in South-East Asia, we are used to hearing the impressive numbers that illustrate the region’s progress. Its economies are forecast to grow at 5% annually until 2020, exceeding global growth of 3.52% per year. Its urban population is growing by around 2.2% annually, while the middle-class population is set to increase by 70 million to 194 million by 2020. And with more than 600 million people, ASEAN has the third-largest labour force in the world, after China and India. But behind those big numbers, what will make ASEAN an economic force to be reckoned with? Much of its success will hinge on how countries in the region capitalize on the huge opportunity presented by emerging technologies. At the heart of this are the possibilities created by what Professor Klaus Schwab has termed the Fourth Industrial Revolution . In the real-estate sector, we expect the changes to be positive and transformational. Our research leads us to believe that technology will enable many ASEAN member states to bypass current infrastructure and developmental constraints to transform the way their citizens work, live and play. In terms of work, office demand will change due to greater outsourcing from developed markets, more flexible work practices, and an increase in co-working spaces. While the growth of global office demand slowed after the financial crisis, South-East Asia has bucked the trend. We expect office demand to grow 6% per year until 2020 thanks to economic growth, further acceleration of outsourcing from developed markets and the rise of the middle class. Co-working and serviced office space currently accounts for 1 to 5% of total office stock in developed cities and is growing rapidly due to the sharing economy, flexible working and freelancing. 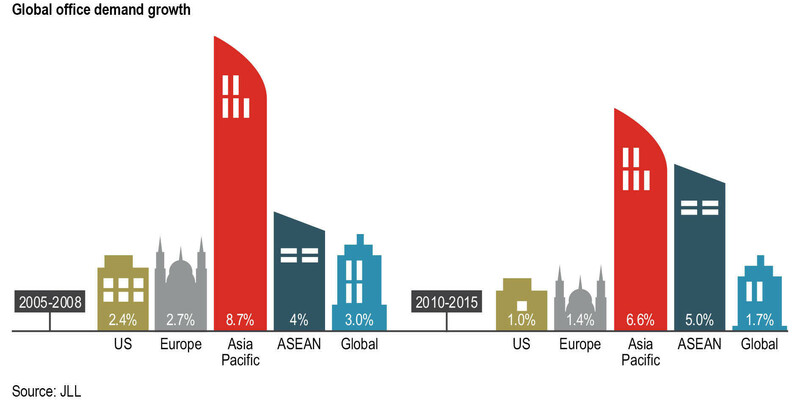 In South-East Asia, co-working spaces could make up 10 to 15% of total office stock by 2030. In developed markets, online retail sales already make up 5 to 15% of the total, and retail space per capita has peaked. In South-East Asia, online shopping penetration is higher than rates in developed markets such as the US and UK. According to research by management consultant Bain & Company, 50 to 90% of consumers in South-East Asia living outside cities are bypassing their PCs to use mobile phones to shop online. But rather than diminish the demand for physical stores, this is likely to result in increased adoption of the online-to-offline model. Shopping centres will be used as meeting places and for consumers to touch and feel products, and many will choose to shop online but collect items in store. New technologies and new uses for existing technologies have the potential to transform the way we move within cities. Intelligent traffic management, car-sharing and autonomous driving are expected to ease congestion and enhance mobility. Traffic congestion in cities such as Jakarta and Manila is legendary and this is mainly due to inadequate investment in mass rail transit and a lack of caps on car ownership. However, online platforms such as Waze, Grab and Uber are allowing the use of mobile-phone data to enhance government efforts in traffic management. Meanwhile, mass rapid transit projects are under construction in Singapore, Kuala Lumpur, Bangkok, Manila and Jakarta that will increase rail length by 50% by 2020. In terms of real estate, this will create new hubs, new investment opportunities and the potential to create innovative mixed-use developments that facilitate people’s ability to live, work and play more easily. In many ways, technology could allow cities in South-East Asia to leap over current constraints to greater efficiency. However, it is clear that alongside the many positive indications, there are challenges ahead. Smart use of technology does not substitute much-needed investment into infrastructure. 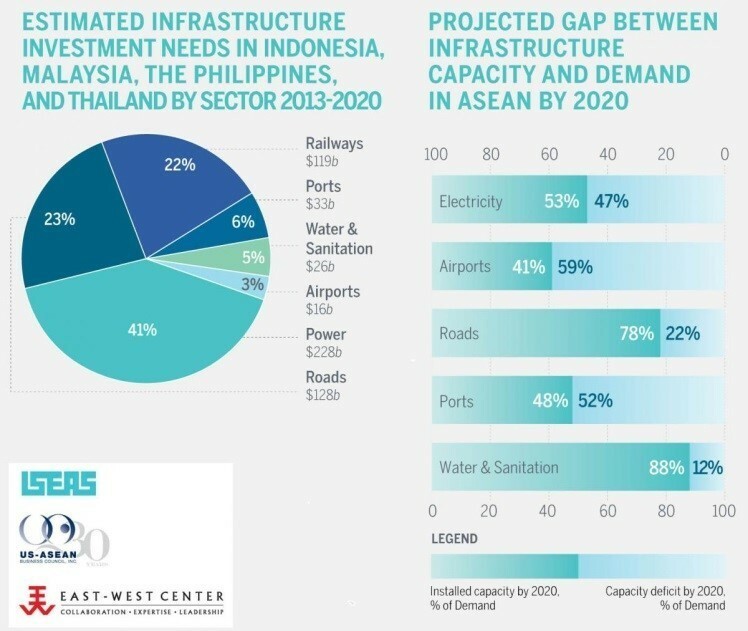 According to the Asian Development Bank, ASEAN needs to pour $60 billion per year into critical infrastructure projects such as roads, rail lines, power and water. Another of the key challenges faced by the ASEAN Economic Community is how to ensure that the economic benefits of regional integration reach the less developed member states, as well as the less advantaged citizens within those states. In addition, many countries will need to improve their data transparency if the bloc is to truly reap the benefits of a single market. To succeed, ASEAN must also work hard to leverage its cultural and linguistic diversity rather than be overwhelmed by it. As the profile of ASEAN increases globally, more and more multinational companies are recognizing the significant opportunities in the region and developing strategies accordingly. If member countries can harness the power of emerging technologies, they have the opportunity to build an economic powerhouse to rival both China and India. This article is part of our ASEAN series. You can read more here .